Small- and medium-sized businesses, non-profits and government organizations throughout Los Angeles and Southern California are in luck! The Mitel Phone Manager and Zultys MXIE are on sale today for your Mitel MiVoice Office 250 (former Mitel 5000, 5200, 5400, 5600, and 5000 HX variants count too) and Zultys MX-30, MX-SE, MX-250 and MXvirtual systems, respectively. Several licenses of each desktop software are, as of the time of writing at least, bundled in with the purchase of a new system, so you can roll out advanced features to power users and VIPs right away. Extenda also sells enterprise-grade Unified Communications software for large deployments, with the Mitel MiCollab software being the most popular for the MiVoice Business (former 3300 and MCD). I would argue that the Phone Manager and MXIE UC clients are as good or better than competitors such as Microsoft Lync, at a fraction of the cost. Not to brag, but deployments on Mitel Phone Manager and Zultys MXIE take hours instead of weeks, and you don’t need multiple servers to get them to work. Zultys doesn’t even require an external host computer – the MXIE runs right off the physical, virtual, or cloud-based system appliance. 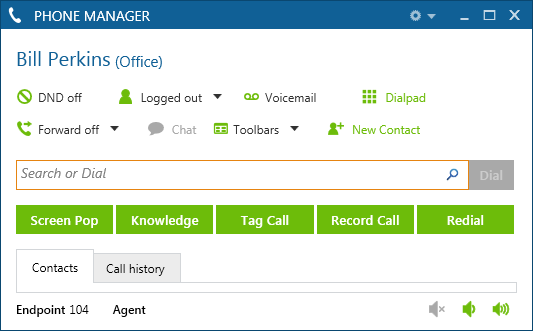 Mitel’s Phone Manager allows you to control your status. This lets coworkers know where you are and tells the phone system where to send your calls. Cutting through the marketing hype, I will use myself as a (very, very biased) case study, so you can see how I use my MXIE UC client to make my work life better. I can see in Outlook and on MXIE what everyone in my company is doing – are they available, on a call, logged out, in a meeting, etc. I can then choose to text someone who is on the phone, or call them if they are around, or send them a voice message they will hear later, or email. I have access to all of these options through MXIE or through Outlook – just hover over a user’s contact or email address. When I need to get up from my desk – rare, but it happens – I change my status. Having created what are called ‘Find me / Follow me’ rules, I can decide how I want my calls to get routed. If I am ‘In a Meeting’ calls should go to voicemail, but if I am ‘At Lunch’ calls should try my cell phone and then ring a backup coworker in the office. An advantage of this type of call forwarding is clear to a mobile salesperson, field technician, plumber, on-site consultant or any other classic road warrior type of worker. You get your calls wherever you are, without giving out your cell phone number to everyone in your life. But there are huge benefits to office workers as well – you can transform your cell phone into a cordless office phone. Everyone knows how to play music and Words with Friends on their smartphone, but leveraging office WiFi allows you to make and receive office calls from anywhere in the building or out, without impacting your voice and data plan. If you have ever shopped for a cordless office phone, you probably know the sad truth that prices start at $200 a device and climb steeply if you need multiple antennae or access points. 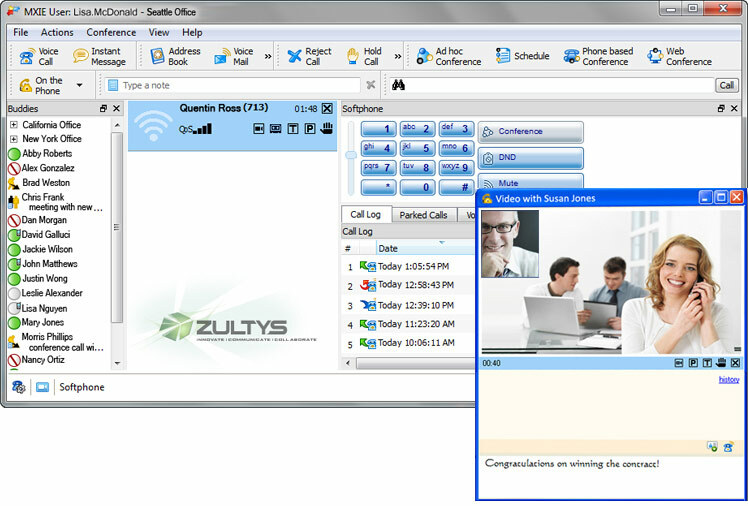 The Zultys MXIE conference call feature could not be easier. Automatically integrate new conferences into your Outlook calendar to block off time and set reminders. Send formatted conference invites out like a pro. Drag and drop participants into a call too, for on-the-fly conferencing. Conference calling and collaboration are increasingly vital parts of my work day. 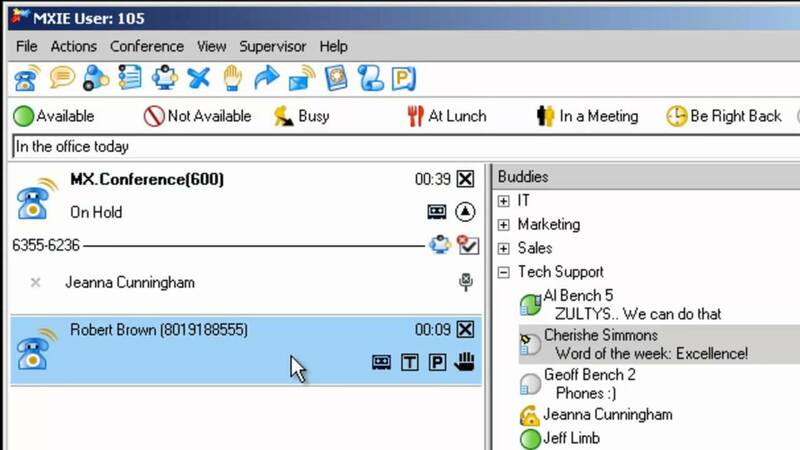 I even have to pay attention during these calls now, instead of putting my phone on mute and surfing the internet, protected by my blocked off calendar time labeled ‘conference call’ – ah the good old days. Setting up a conference call continues to be either painful or expensive for most companies. UC desktop software solves this riddle – just a few clicks and you have a conference set up, you sent out the invites with automatically formatted instructions, your calendar has the time and instructions blocked off, you get a reminder on MXIE, and if someone throws you a curve ball and wants to join last minute, just use your mouse and drag their icon or call into conference. They enter the PIN and you look like a hero. Collaboration always means desktop sharing and video. 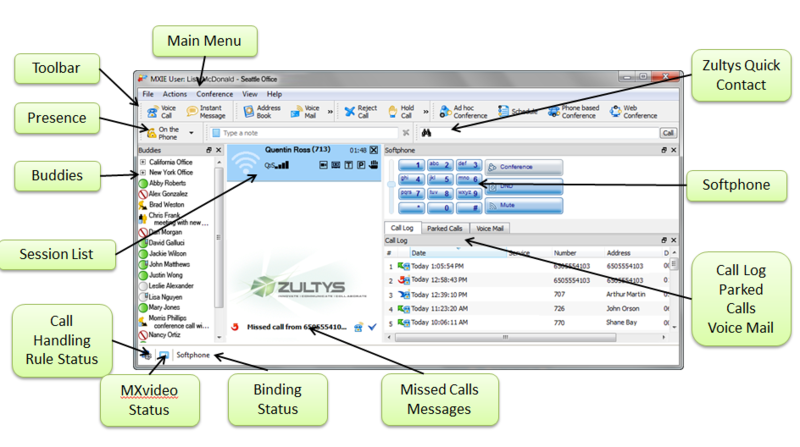 The Zultys product provides all of the above out of the box with a few MXvideo licenses included in every system. There is an optional add-on, the MXconference, that can allow you to expand your conferencing to hundreds of users for webinars useful for internal communications, sales, training and showing off your new haircut to everyone you know. Instead of reaching for the phone, I just click my MXIE interface when a call comes in. 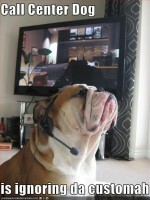 I can, with my mouse and/or keyboard hotkeys, transfer calls, send calls to voicemail, park and hold calls. Yes, this is easier than lifting up the phone – my hands are always on a keyboard and this makes it easier to stay in a productive groove. At a glance, I see all the calls active on my phone too – this is another item that has bedeviled phone users for 30 years. Juggling multiple calls when I just had some red lights and a tiny display was never easy. Everyone over age 30 has likely answered the wrong line with the wrong name, dropped calls, transferred calls to the wrong person, and otherwise let your callers know that you are a bit of a phone klutz. Now, you can just drag and drop calls to other users, see the caller ID, and basically have no excuse for hanging up on anyone. Dialing out is just as easy. Now you can simply highlight a number and hit a hotkey in any application on your computer. Whether on a webpage, Outlook contact, email signature or in a PDF, if you can highlight the number, we can dial it. This is especially helpful for environments where, if you are like me, you might have a list of people to call back at set times when your schedule opens up. You can make a spreadsheet and just knock out a bunch of calls in a row without touching your phone. Both the MXIE and Mitel Phone Manager transform into a full-blown telephone – just add a USB headset if you want some privacy. This saves you money over deploying physical phones throughout the office, as you not only avoid the phone itself but the Power over Ethernet switches and electrical power costs. It also let’s you skip cabling, as it will work over a computer’s WiFi connection, or skip out of the office. For years, we sold a second IP phone to managers as a home office phone, but with softphones, this is largely unnecessary as it is more convenient to have a license on a laptop, tablet or smartphone, though perhaps not as impressive for guests. The MXIE even runs natively on Mac and Linux, in addition to Windows. The Mitel product is limited to Windows. The MXIE offers a smartphone app for Apple iOS and Android phones and tablets that fully integrates the majority of desktop UC functions into the palm of your hand. Calls can be sent to the app rather than the cell phone functions, so you can retain full system features such as hold, transfer and conference. These mid-call features are available with the Mitel through the basic system and accessed via touchtone keys rather than touchscreen. Interestingly, the MXIE doubles as an Operator console without additional licensing, so full-time receptionists can take advantage of the UC features. The system provides a full set of user tiles for easy access to everyone’s status and better capabilities for handling a high volume of calls. A similar product from Mitel is called the Attendant Console, which is separate from the Phone Manager. The Attendant Console, however, allows for Attendants to also make a limited number of programming changes to the telephone system. The best part of UC is that it can save you time. 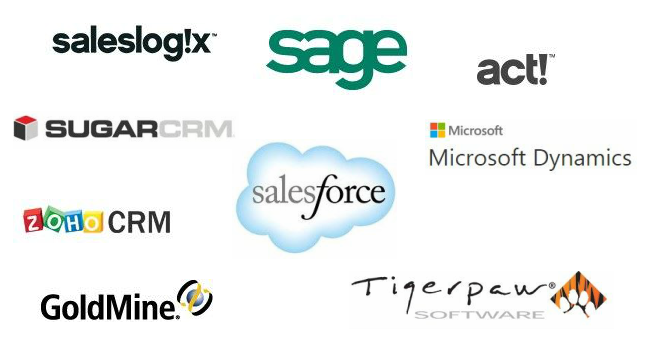 With optional licensing, we can integrate your MXIE or Phone Manager to Salesforce, Outlook, Act!, Goldmine, MS CRM and Dynamics, and many other popular CRM packages. There are APIs and SQL integration available too, as well as the ability to use GET commands to integrate to other web-based packages. Why do you care? Because we can open a customer record automatically when they call in or you call out, we can open a ‘new record’ when an unidentified number comes in, and overall, we can make it easy for you to improve the quality of customer interactions while cutting down on the time spent on data entry. The Zultys offers out of the box integration to SalesForce or a Flex Communicator license that allows integration to a host of different CRMs. Mitel Phone Manager’s core strength is the number of out-of-the-box integrations it has with different CRM packages. 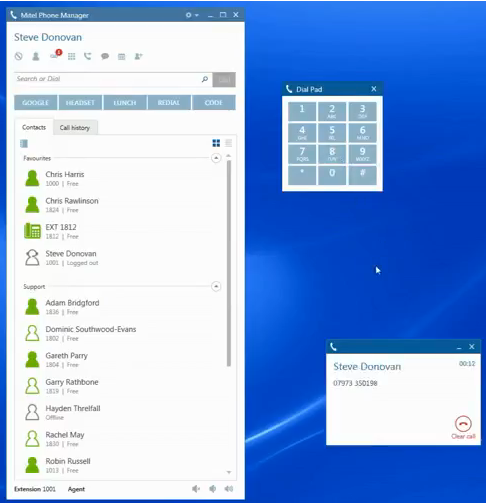 Screen pop just about anything you can think of with the Mitel Phone Manager’s CRM integrations. Costs vary by system and how many users you have on the system, as we can bundle licenses together in bulk purchases, but in general, I would budget for about $200 per seat, about the same cost as three months of a SalesForce Pro subscription or a single license of Act! Pro 2013. However, both systems have starter kits that include a number of these UC seats, so often customers find that they don’t need to purchase seats a la carte. Compare these costs to Lync – upwards of nearly $2500 in the first year!